At Kobe, we strive to exceed our customers' expectations for quality and performance. Every bearing we produce embodies the Kobe tradition of reliability at a fair price. 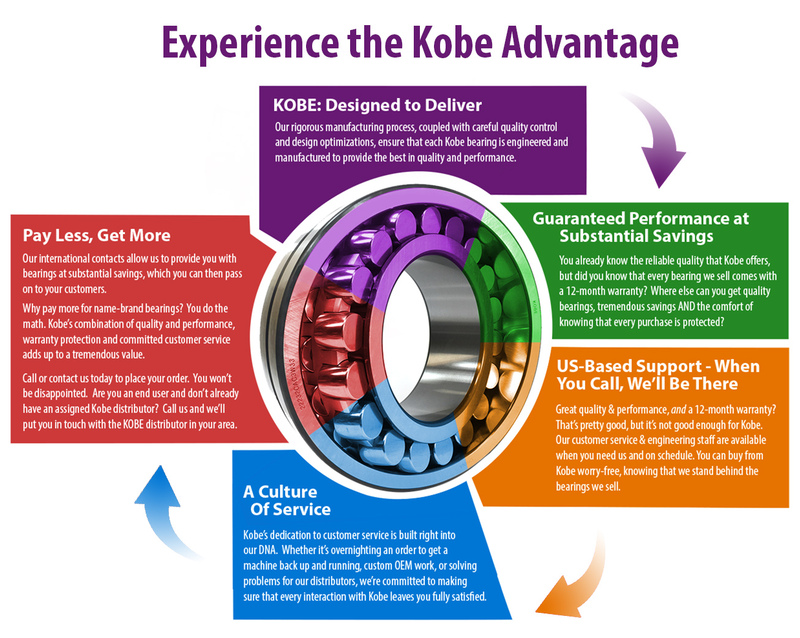 Kobe maintains high levels of relevant inventory across a wide array of industries, allowing your customers access to critical bearings, reducing downtime. Each Kobe product is backed by a 12-month warranty and exceptional customer service, a combination that adds up to real value. Ball bearings vary in design to accommodate a wide spectrum of applications, and are available today through your local distributor. Cam followers, commonly named track rollers, serve to transfer linear or rotational motion. Spherical roller bearings are prized for their large carrying capacity. Your distributor can help you decide which spherical roller bearing is right for you.